The head of the Office of Personnel Management said Monday that he plans to spend much of this year advocating on behalf of large-scale civil service reform, both through legislative proposals and administrative changes. 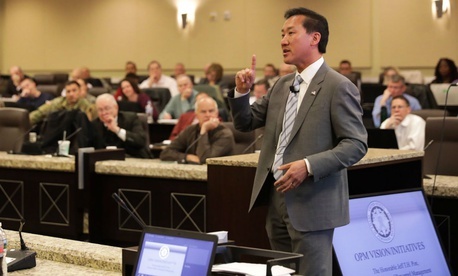 During a conference call with reporters Monday morning, Pon laid out his vision for the future of the federal government’s human resources agency, stressing his desire to move HR practices to the digital space, as well as a plan to reassert long-dormant authorities available to his office. Pon echoed comments of OMB Deputy Director for Management Margaret Weichert, arguing that as the 40th anniversary of the signing of the 1978 Civil Service Reform Act approaches, it’s time to revisit federal hiring, performance management and compensation. Pon did not elaborate on what the administration’s civil service reform legislation might look like when introduced, but he said he would be much more proactive than previous OPM directors, who he said “nibbled around the edges” of civil service issues. The OPM director said he plans to work with federal employee unions on development of new personnel and compensation systems, and he bemoaned benchmarking employee pay using data systems based on “how we did things in the 1970s.” While federal employee groups typically point to data from the Bureau of Labor Statistics, which suggest feds are underpaid compared to their private sector counterparts, Republicans often cite Congressional Budget Office studies that suggest the opposite. Pon acknowledged that tackling civil service reform in Congress is a daunting task, particularly during an election year, but he said it’s a goal worth pursuing.